Alexandria High School has produced some great players over the years under the leadership of Thomas Bachman including at the wide receiver position with guys like DJ Chark, who is currently the number one receiving target for the LSU Tigers this season. This season, the Trojans have themselves another special playmaker on the outside in senior Jorien Vallien. Unlike other great receivers in North Louisiana, Vallien may not be as filled out as Terrace Marshall Jr. (Parkway) and JaRay Jenkins (Jena) in weight, but he is definitely a SEC wide receiver. He has great 6-3 length as well as legit 4.5/40 speed and great hands. Vallien has all the tools to become a big time player at the next level. Right now, he looks like that he can start for a lot of DI teams and already, he has a lot of offers from not only DI schools, but SEC schools. Not only does he look the part, but he plays like it as well. Vallien came off a separated shoulder against Ouachita and put up the best game of his career with almost 300 yards receiving and four touchdowns. Just imagine what Vallien can do when he is 100% healthy. Last season, Vallien had 1,000 yards receiving and 11 touchdowns. Vallien really broke through in his sophomore year when he had 1,066 yards receiving and 10 touchdowns. If Vallien can have another 1,000 yard and 10 plus touchdown season, it is pretty safe to say that he will come down as one of the best players to play for the Trojans. 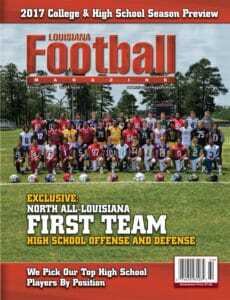 Louisiana Football Magazine’s recruiting expert Lee Brecheen has a lot of respect for Vallien’s game and put him on the North Louisiana cover with all of the other great prep players in North Louisiana. As of right now, Vallien is still trying to figure out where he wants to go to college to continue his football career, but whoever ends up taking the three star receiver is definitely getting a star in the making. In today’s recruit spotlight, we caught up with the senior Alexandria wide receiver as he talks about his high school career, the Ouachita game last season, his season’s goals, his top schools, and so much more! LAFM: What is your name, position, and school you play for and why? 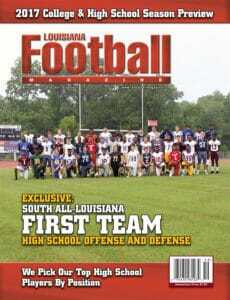 My top schools are LSU, Louisiana Tech, Tulane, and Washington State. 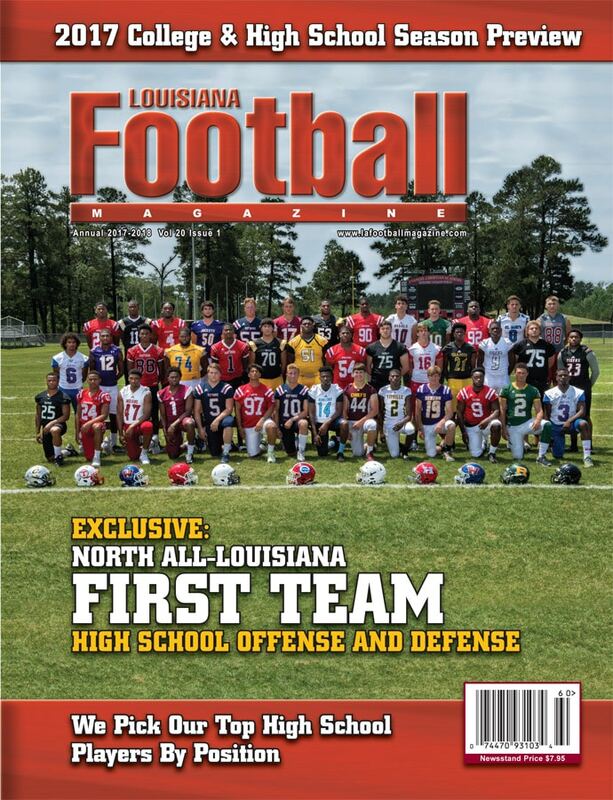 LAFM: You are on the cover of our North Louisiana edition of our magazine. 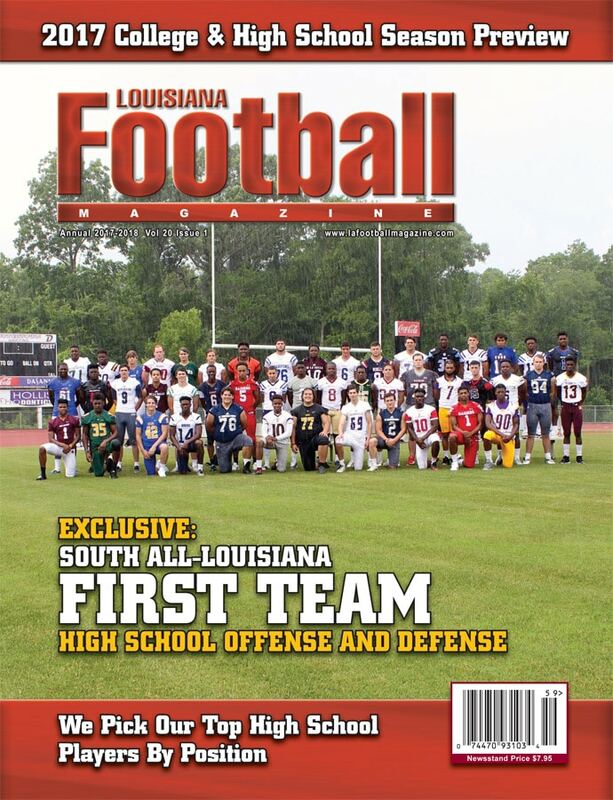 What does it mean for you heading into your senior season to be recognized as one of the best players in the state? I’m very thankful first off because it’s a great accomplishment and honor. As for as my high school career, this is by far my biggest recognition which lets me know that all my hard work, sweat, and tears are paying off. My biggest strengths have to be my hands and ability to catch the ball effortlessly. Also, my route running and ability to get open in whatever coverage is thrown at me and then go and make the big play for my team. 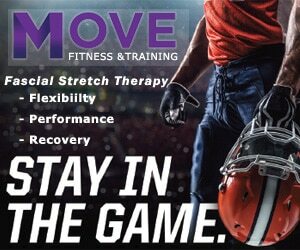 LAFM: What are some areas to your game that you need to improve on before going to college? I definitely need to work on my speed. Getting my 40 time down would help a lot. LAFM: What are some things that you look at when choosing the school that you want to attend to? I’m looking for in a college just some place that can feel like home and family as well as a group that is all focused on the same goal. Also, I am looking for a place where I can go and make a difference with my talents while continuing to get better and better. LAFM: What are some of the biggest accomplishments over your high school career? Well, I believe last year against Ouachita. I was just coming off a separated shoulder injury and I had 297 yards and four touchdowns to help in a big district win for the team last year. LAFM: Alexandria had an up and down season last year going 6-5. So far, the team had a slow start this season losing its first two games. What does the team need to do tonight to avoid an 0-3 start against Peabody? We need to get our season on the right track. We just have to go out and execute on all cylinders. Also, we don’t have to do anything fancy or tricky, but we just need to go out and execute our opponent each week. If we do all of those things, we will do big things this year. LAFM: What team or teams have you marked on the schedule and are most looking forward to playing against this season? I am definitely looking forward to play against Peabody this week because that’s a big city rivalry. I am also looking forward to play against West Monroe and Ruston as those are two good district teams in my four years playing that I never gotten a chance to beat. I love having one final opportunity to do that with my brothers. LAFM: Our recruiting expert says that you are the best receiver to come out of the school since DJ Chark a couple of years ago. What does that comparison mean to you and do you model you game after DJ’s game? That means a lot because I look up to DJ as someone to pave the way for myself and the other athletes in the city of Alexandria to do the right things and work hard until that hard work pays off. He has definitely taught me that principle. LAFM: What is the best game of your high school career so far? I have a tie between my first game starting at cornerback as a freshman against Peabody where I had two interceptions as well as a pick six and my game against Ouachita in which I spoke about earlier. I like to get involved in any sports that I can whether it is basketball or track. I guess you can say that I love sports. LAFM: What are your goals for the season? One big goal of mine is what I talk to my Dad about a lot is taking that step into the next tier of players in the country. I’ve two pretty good years with 1,000 yards and ten plus touchdowns, but this year, I set out to get 1,500 plus yards and at least 25 touchdowns. I am on the right track with five touchdowns in the first two games this year. LAFM: What is your message to the Alexandria team and the fans for this season? I just want to let everyone know out there who is a true Trojan fan to keep that Trojan pride because soon, we will get the engine rolling and get back on track on our way to the top! LAFM: Who are some people in your life that you need to thank for helping you be in the position that you are in today? I definitely want to thank my mother and my father, who have given me life, but also to Coach Carmouche, who was the first coach to give me an opportunity. I also want to thank Coach Bachman, Free, Skipp, Sevario, Coop, and Burch for coming to ASH my sophomore year and molding me into the player I am today. Well, I didn’t start officially playing organized football until eight grade. LAFM: What makes you stand out from all the other wide receivers this season? I strongly believe the way I work day in and day out puts me in the position that I am not supposed to be at because I’ve been said that I was “too slow”, “too weak”, or “not good enough”, but through countless hours of hard work, I’ve been able to be where I am today thanks to God above.